Gadget dismantlers iFixIt managed to get their hands on one of the very few Valve Steam Machine prototypes late last week. Despite only 300 prototypes being sent out, making these machines almost a PC Gamer equivalent to a Willy Wonka Golden Ticket, someone allowed the iFixIt guys to attack their precious new baby with screwdrivers. Following the disassembly of this particular machine, remember the components vary, the dismantlers tallied the cost of the parts to be roughly US$1,300. We saw an amateur 'teardown' of a Steam Machine about a week ago when YouTuber Corey Nelson released a series of Steam Machine, Steam OS and Steam Controller 'first impression' videos. However you can rely on the iFixIt team to delve deeper and more methodically; it's their stock in trade. To begin the analysis the Steam Controller was first to be pried apart. The controller is wired only, so needs no battery compartment, just a long USB cable. The main component in the pad, tasked with sending all that varied input to your Steam Machine, was identified as the NXP LPC11U37F microcontroller. 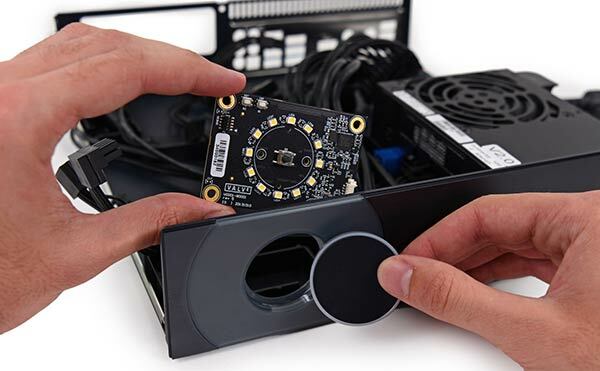 Now iFixIt looked at the ports on offer on the Steam Machine itself. 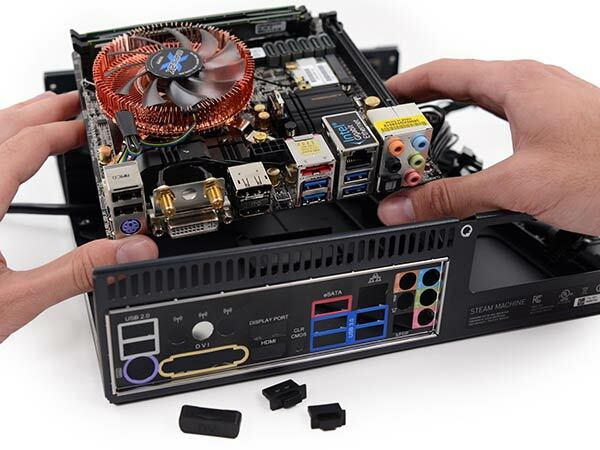 One gang of ports all come from the ASRock Mini-ITX motherboard. This includes a standard roster of USB 2.0 and 3.0 ports, PS/2 keyboard and mouse, S/PDIF, eSATA, Ethernet (and a Wi-Fi antenna connector), 3.5 mm audio in/out, rear speaker, c/sub, and microphone ports. This motherboard also sports DisplayPort, DVI, and HDMI ports for use with the integrated graphics (Intel HD Graphics 4600 from the i5 chip) but Valve had thoughtfully filled them with grommets - so you would be swayed towards plugging your monitor into the ZOTAC GeForce GTX 780 3GB GDDR5 graphics card – simply by fumbling along the path of least resistance. So what other components were in there? This Steam Machine complemented the ZOTAC motherboard and GTX 780 with a 3.2GHz (3.6GHz boost) quad-core Intel Core i5-4570 processor cooled by a Zalman CNPS 2X Mini-ITX CPU cooler. Two sticks of Crucial Ballistix Sport 8GB DDR3 (PC3 12800) RAM gave the machine 16GB in total. For fixed storage the machine had a 1TB 2.5-inch Seagate ST1000LM014 laptop SATA III SSHD (Solid State Hybrid Drive), this drive has 8GB of NAND. Other components included a SilverStone SST-ST45SF-G 450W SFX12V SLI Ready CrossFire Ready 80 PLUS GOLD Certified power supply. Another SilverStone component necessary to this machine build was an RC2 PCI Express x16 riser card to facilitate the fitting of the GeForce GTX 780 within this custom chassis. As PC enthusiasts you probably aren't surprised to find that iFixIt concluded that the Steam Machine was eminently repairable and it attained a score of 9/10 - with 10 being the easiest to repair. The main chassis is opened easily after the removal of a single Phillips screw and it is stuffed with modular off-the-shelf components. RAM chip access and reassembly cable routing were the only potential sticky problems to tinkerers. With a parts list adding up to approximately US$1300 this unit would be marked up to a price about three times console competitive territory. However there are going to be a wide range of Steam Machines available, as soon as January we are expecting a US$499 example from iBuyPower to be shown at the CES Las Vegas. This is one of the great things about Steam Machines – and PCs – you can build it to the spec you want now and usually upgrade later. Acer launches Helios 700 gaming laptop with sliding keyboard Nvidia GeForce RTX 2080 Ti overclocked to 2.94GHz QOTW: What wattage is your power supply? Nvidia teases GeForce GTX 16 series gaming laptops Has Samsung been chosen for Intel Xe GPU manufacturing? …and that's it. I guess I wanted it in the shape of a companion cube or something but, it just looks, well, normal. Still don't see a point to this. It could swing people who are put off PCs on the basis that they believe it's all too complicated and they'd be forever fixing problems. I have friends who have never owned PCs, only Macs and games consoles. Some of them are pretty disappointed by the lack of power of the PS4/WiiU/XBO class, but they've been very interested when I've shown them the Steam Machines. If Valve can find a way to make updates as unobtrusive as they are on other consoles (i.e. still pretty obtrusive on occasions, but at least make the updates of component drivers happen in secret), then this could win them a big chunk of the console market. As for the PC customer, I think there are still advantages there. If they sell well and developers start to prioritise the Steam configurations, that could be a very good reason to buy one right there (or at least to model your build after their kit list, and use SteamOS for your gaming). And if the first range of Steam Machines don't tempt you, I wouldn't bet against the next family or the one after that becoming the only PC you own. I'd certainly like to have a little console-sized PC. First off I'm going to second Otherhand's post (#4). Secondly, this isn't a general purpose Personal Computer, it's a console. Okay, it uses PC parts, but then again, so do the XBone and PS4 - and yes, I know that the current Steam Machines seem to be priced at costs that seem to be approaching twice those “conventional” consoles, but remember it's early days. Valve have been consistent in saying that it's app spread is gaming and media playing that's it. But, since it's based on Linux, if someone wants to add other capabilities then they're not going to call in the lawyers. Remember that there's nothing stopping someone else (Lenovo, Dell, etc) from raiding their parts bin, slapping on Valve's “free” OS and getting a foot in the “gaming console” market. And of course there's all those “back street” computer shops who can do something similar. This is going to rise, (or fall - which I think more likely), on the support offered by the big publishers. For example, if next year's Call Of Duty was available then it's got a fighting chance, on the other hand if it's limited to Valve themselves and a couple of indy's then wave it bye bye.